The greatest experience and know-how, as well as one of the widest filter ranges in the market make MSA filters the first choice for users in all industries. The high-performance particle filter P3 PlexTec and the combination filters use the PlexTec Media to provide even better comfort for the user. MSA PlexTec is based on a particle filter element with a significantly increased filtering surface. The reduction in inhalation resistance improves filtering performance and service time, while at the same time allowing slightly more relaxed breathing. Additionally, using PlexTec Technology, filter housings have been reduced in size, being now more compact and lightweight. The most frequently used filters are of the ABEK type, which protect against many hazards at the same time, due to the wide range of protection that they provide. Based on EN 14387, these filters have an application range designat ed by the code letters A, B, E and K. Benefits for the user include: safe selection, no mix-ups, economical procurement, simpler stockkeeping. High-grade multiple range filters have an even greater sphere of application, as e. g. the combined filter 93 ABEK CO NO Hg/St or 93 A2B2E2K2 Hg/St. The 9X series of MSA gas and combination filters are in full compliance with the REACH regulation and do not include any toxic materials listed in the European Regulation. Respiratory filters protect against numerous known con t aminants which, if inhaled, can be dangerous to health: toxic gases, vapours and particles, as well as many combinations with immediate or delayed harmful effects. The efficacy of filters designed to provide respiratory protection is dependent on the ambient atmosphere. The oxygen content of the inhalation air must be sufficient, at least 17 vol.%! Type, properties and composition of the hazardous agent in the ambient air must be known. Material Safety Data sheets may contain this information. Local regulations concerning the use of filtering devices, the request ed oxygen content and the threshold limit values may differ and must always be observed. When using a particle filter, no hazardous gases may be present in the ambient air, when using a gas filter no hazardous particles. In case of doubt a combined filter must be used. Filtering devices must not be used in confined spaces such as containers, canals, etc. due to poor ventilation. Only filters with a weight of up to, but not exceeding, 300 g may be used on quarter and half face masks. Only filters with a weight of up to, but not exceeding, 500 g may be used on full face masks. Never use filters that show signs of damage. If you are in doubt concerning any of the above-mentioned points, or if you believe that the composition of your atmo sphere at work has changed, use protection that operates independently of the ambient air. 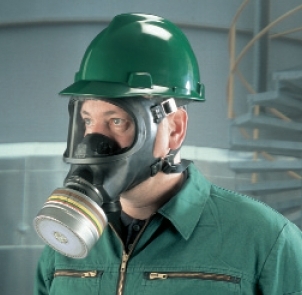 MSA provides you with a wide range of breathing apparatus and airline devices. With combined filters - depending on the predominant protective function - both criteria must be observed. Particle filters must only be used once against radioactive contaminants, spores, bacteria, viruses and proteolytic enzymes. Some filters have a specified maximum service time (CO filter cart - ridges, combined filters 93 Hg/St) or they have an incorporated warning system (CO filter canisters).